Eight Australian and two New Zealand poets have been shortlisted for the C$20,000 (A$20,440) Montreal International Poetry Award 2017. Australians shortlisted for the award are S K Kelen for ‘Soldiers’; Christopher Kelen for ‘An Attitude of Waiters’ and ‘The Thieves Have Gone’; Anthony Lawrence for ‘Blue Curtains’; Marjorie Main for ‘The Ways’; Felicity Plunkett for ‘Syzygy’; Chloe Sparks for ‘Old Blue Suitcase’; Julie Watts for ‘Afternoons in and out of Paradise’; and Lauren Williams, for ‘My Ill-Omened, Mid-Life, First and Last Southern Wedding’. New Zealand poets shortlisted for the award are Ashley Chain, for ‘Windchime Meadows—Spring’, and Bryan Walpert for ‘Tranquil’. 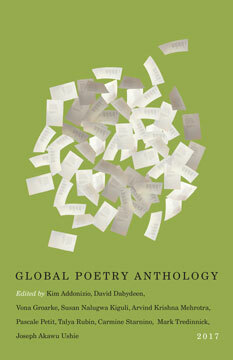 Fifty poems were shortlisted for the award, which were selected from 2200 entries from 70 countries. The winner will be announced in December. For more information, click here.